Documentary wedding photography is chasing me around the internet at the moment. No sooner do I leave one photography forum on Facebook because of a tedious argument than it turns up on another. You can’t escape it. The ‘Real’ documentary photographers get their lens caps in a twist over this one. The issue usually starts with someone posting a link to a photographer’s website because they have used to term ‘documentary wedding photography’ but have featured images of people LOOKING at the camera. This is currently the biggest crime in the photography world. It used to be vintage post-production, but that seems to have disappeared now. Thank God. These Facebook rows turn ugly for a straightforward reason - documentary wedding photographers are so precious about their ‘Art’, and anybody who uses the word ‘documentary’ in their marketing has to play by the rules or the self-appointed guardians of the term are quick to step in and proclaim their indignation. It can be brutal. I'm not sure when the Documentary Wedding Photography Police first appeared but they are everywhere and you'd better not mess with them. What amuses me about these arguments is that the docu-fans are just revealing how little they know about photography. Documentary wedding photography doesn’t exist the way they imagine. The rules appear to be that nothing must be staged, no one must be looking at the camera, every shot is 24mm as wide as possible and converted to grainy black and white. I pondered these rules as I browsed the Magnum website this morning and the work of documentary photographer Alec Soth caught my eye. His fantastic book Sleeping by the Mississippi is shot on an 8x10 inch camera, features a mix of landscapes, interiors and portraits. And heaven forbid, the subjects are sometimes looking at the camera! God knows what the documentary wedding crowd would think of this work posing as ‘documentary’. There are many more examples like this. Documentary photography breaks the documentary wedding photography rules over and over again - but it appears none of the photographers tut-tutting on Facebook seems to have noticed. The fact is that documentary photographers tend to work on very long-term projects and use a wide variety of techniques and styles to tell their stories. They also tend to work as independent photographers without a brief or payment from a client. A wedding takes place over a relatively short period and is commissioned - there is a client who has specific demands, mainly that they and their event looks beautiful. You couldn’t get further away from documentary photography if you tried. Photojournalists, on the other hand, tend to work for a client, are paid by the client and work on a story over short periods of time - so wedding photojournalism is probably a much better description. Unfortunately, a photographer working on a newspaper or magazine shoot will also use a variety of techniques to tell the story. They don’t give a monkey's if their subjects are looking at the camera or if they have to stage a shot to satisfy a brief. So where does this leave the documentary wedding photographer? Raging on Facebook mainly, fighting an argument they can never win. Desperately trying to impose a set of made up rules that fit the way they work and the way they market their businesses. That’s all it is - a marketing term to disguise the fact they can’t deal with people and set up the odd formal group shot. Get over it! Hilarious - there is a cabal of, should we say, 'more mature' male photographers who think they have the right to use certain terms to describe their work. They are the same ones who are also constantly moaning at declining sales! 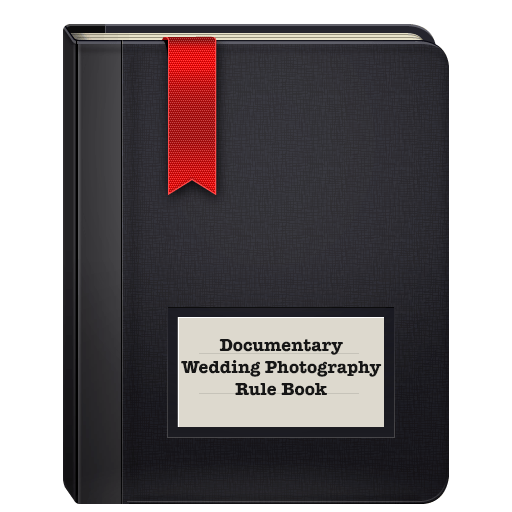 "I'm not sure when the Documentary Wedding Photography Police first appeared" - brilliant! I've always called it 'Reportage wedding photography" - can't keep up these days. What a load of rubbish, it’s Reportedge anyway, not documentary. The first rule is nobody should even see the photographer, that’s why I go undercover to weddings. I hate those documentary guys - they are such babies! - they stole this rulebook from me. By the way, Reportedge is the correct term. LOL - this is actually so true! Great article. I'll keep shooting a mixture of documentary and killer portraits and mop up all the work. Hi Lee - hats off to you.Is this from your latest SEO workshop? Clever.